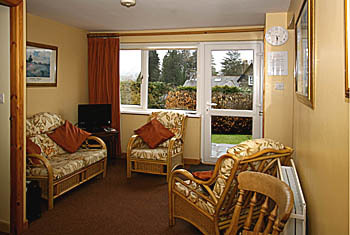 Situated in a gently elevated position five minutes walk from the town centre, Orchard House Apartment overlooks Ambleside with lovely views towards Loughrigg Fell. On a hillside site, the apartment occupies the ground floor of a modern house and is accessed by steps from street level. The owner occupies the upper floor which is at street level. The apartment has high quality fittings and furnishings throughout and is personally maintained by the owner who is normally on hand to offer any help or advice you may need. There is private off street parking for one car and on street parking also. Storage is available for bikes. 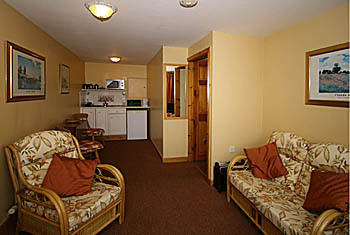 Living accommodation consists of kitchen/dining area within the spacious lounge, which has Freeview TV and is comfortably furnished, with access to the attractive garden and patio with outdoor furniture. Free Wi-fi is available. The kitchen has a microwave cooker, fridge, kettle and toaster, but is not equipped for oven or hob cooking. 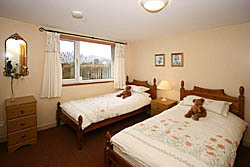 There are two bedrooms, both with fitted wardrobes and en-suite shower rooms, one with twin beds and the other a double bed. The house is open all year and is bookable by the day (minimum two days). 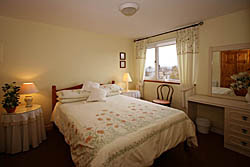 Terms are £60 per day for two persons, £80 per day for four, inclusive of electricity, heating, bed linen and towels. We regret no pets. For bookings, availability and further information, please email the proprietor, Mrs Gillian Dervin at gill@gilldervin.co.uk or phone 015394 31363.